bebop spoken here: CD Review: Jeff Rupert & Richard Drexler - R&D. Jeff Rupert (tenor); Richard Drexler (piano). Yet another 6 CDs landed on the doormat - I'm shopping for a new doormat - and, as usual, they were awash with original compositions. However, this one wasn't. I never wanted to hear Gershwin play jazz which he couldn't and, likewise, I prefer my jazz musicians to do their 'composing' in the form of improvised solos rather than original songs without a hook! 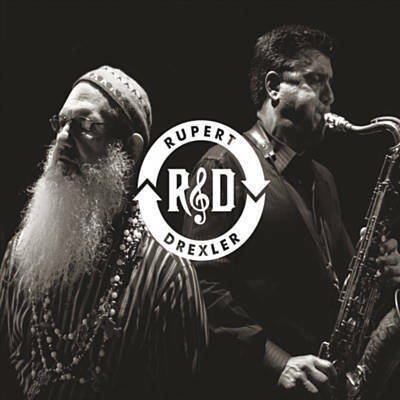 Rupert and Drexler are the perfect duo. Armstrong/Hines, Braff/Larkins set the pattern many years ago and the tradition is continued and updated here by a superb tenor saxophonist and a pianist who meets the saxman's every demand, adding his own 50/50 contribution with scintillating solos and cushioning support. Recorded live, back in 2015, at the Timucua Arts White House in Orlando, Florida, the audience was appreciative in the manner such a venue demanded. To draw a parallel, this was the Lit and Phil on a Friday lunchtime rather than the Jazz Café (or anywhere) on a Friday night. Nine times out of ten I'd even prefer to listen to Summertime rather than Edelweiss, but, this is the tenth time! Rupert and Drexler work their magic so well that the Sound of Music becomes the Sound of Jazz. The Song is You; Someday; O Grande Amor; Edelweiss; Johnny Come Lately; Imagination; The Night Has a Thousand Eyes & Soul Eyes.